Female Standup collar Ao with red Beifeng coat. Made by Jinglian Mantang of Hangzhou. 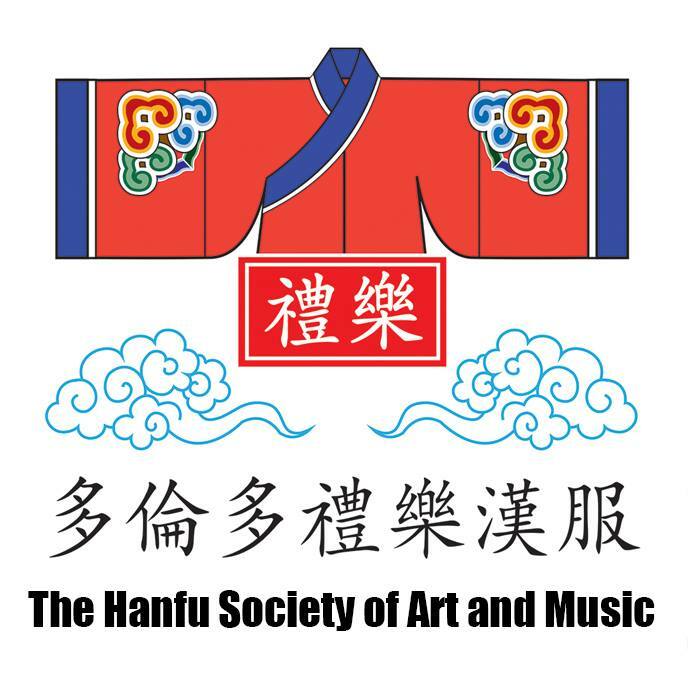 Since its inception, the Hanfu movement has strived to differentiate the flowing robes of the Han Chinese with the vestimentary products of the Qing Empire as totally different concepts. Yet, when we talk of the greatest feature of Qing and post-Qing Chinese clothing – the Mandarin standup collar – we cannot avoid that this is in fact a Han Chinese creation. 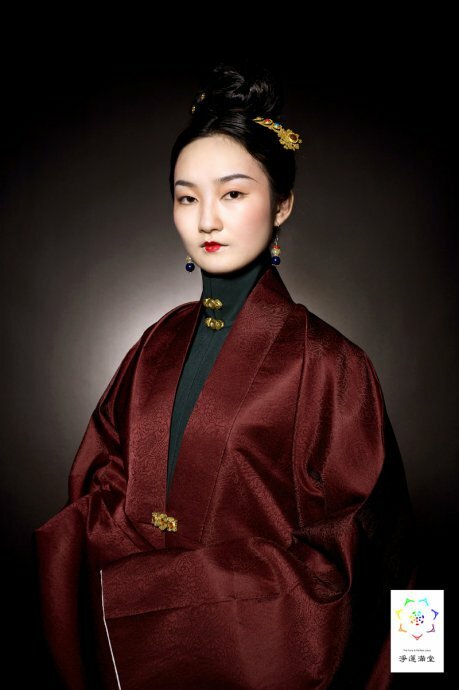 Given the popular notion of Han female garb left unchanged from the “Ten exceptions” in the Queue Order, is there ultimately really a difference among Hanfu collars and Manchu-Qing collars? To understand the evolution of the standup collar, let us look at the origins of Manchu clothing design: Collars that wrap around the neck are non-existant, and to protect the neck, scarves or separate collars are added. Han designs are differentiated from Manchu designs by maintaining an attached collar on tops for women, but due to the differences in collar shape, the short collar design in Hanfu was the only viable solution to Qing designs. 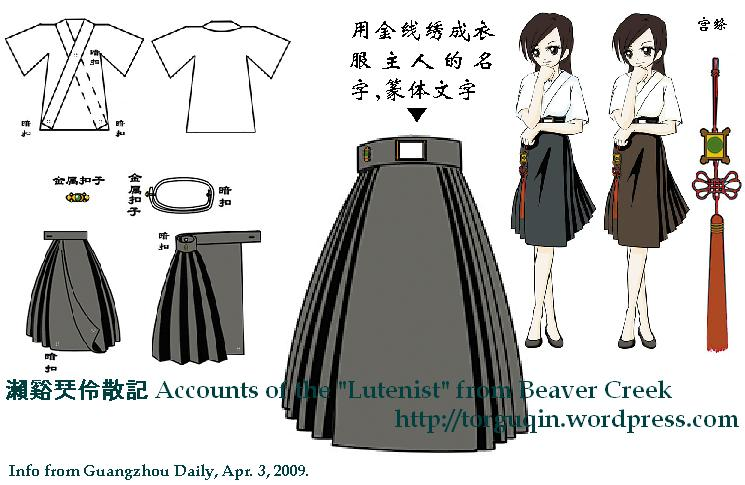 When laid flat or hung, a Hanfu standup collar reverts to a shortened cross collar shape. Clothing and photo from Minghua Tang, 2011 catalogue. In contrast to the rounded Mandarin collars from the Qing to the present time, Hanfu standup collars insist on metal locks, wipe across the neck without any rounded corners, and when laid flat, the collar reverts to a shortened cross-collar piece, and gives generous room for the neck because of extra space given by the metal locks holding the collar back open rather than pulling it together. 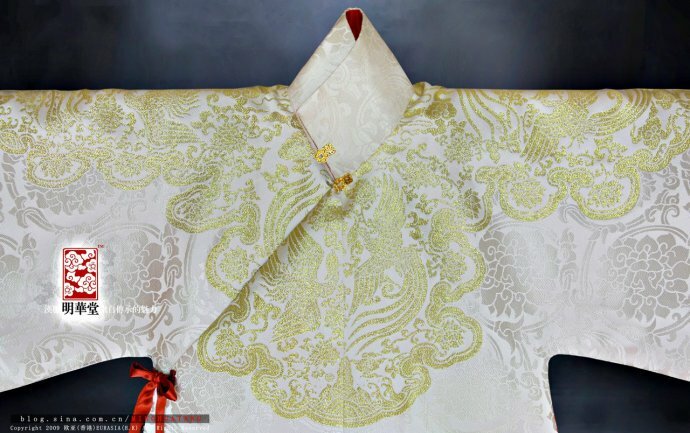 Fast forward to today: Although now we know that the standup collar is not a Manchu innovation but a Chinese one, there is still some reservation by the Hanfu circle about wearing this design in the promotion of Hanfu. As an ‘alternative’ design that only existed in the final days of the Ming, some consider the collar design as ‘period dress’, while others consider it as being too different from conventional Hanfu collar archetypes and should be avoided to prevent confusion to outsiders who have little idea about the clothing. Nonetheless, the standup collar long Ao has a dedicated support base among female Hanfu wearers as winter fashion, and they often boast of delicate gold or silver embroidery, lavish brocades, and fancy metal snaplocks. Following Ming conventions, this Ao is considered casual (or sharp/’posh’ casual) and is not worn as the outermost layer except for display purposes. Recently, major news sites such as Chinanews and Guangzhou Daily has been circulating a set of illustrations to propose a modernized version of Hanfu for use as high school uniforms, and is the first seriously accepted design for Hanfu in our time. Their doubt and hesitance to quickly adapting existant elements has no doubt paid off, in the sense of confirming a public sense of what Hanfu is, differentiating itself from Korean and Japanese clothing of similar appearance. From this, one can see clearly that some even in the earlier times (late Qing, early ROC) were clear that the Qipao was Manchu and refused to wear it, as some sort of last defense against (whatever was left of) the Chinese culture.